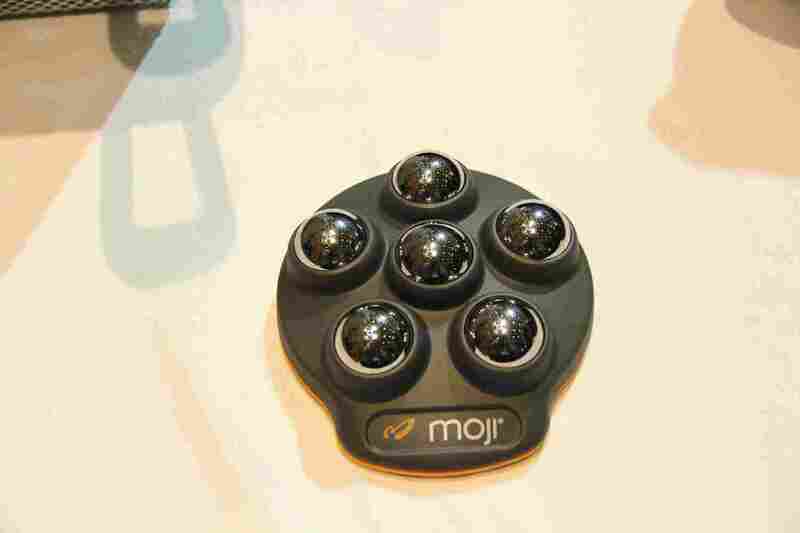 I had a chance to stop by and have a talk with the Moji team at their booth at OR 2017, and received a rundown of their current product line, plus who they are, what their goal is, even an overview on some products to look out for in the future. If you haven’t already heard of them, Moji is a company founded in 2007 by Victor Viner, an athlete himself, who was able to formulate products from the perspective of those who would need them most, with one goal in mind. That goal is to keep people active and injury free through their innovative therapeutic and message tools that come into practical use for a wide variety of complications, and even on a more casual basis. Whether dealing with injuries or not, you will still be able to find use in their products, which I will go over in this article. They have a range of tools for different purposes, and diverse use-ability. So, if you love pushing yourself to the limits, you want to take a look at some of these that may come in handy to bring you back down when your body tells it’s been pushed past it’s comfortable boundaries. First we will go over the PRO line massagers. These feature multiple stainless steel rotational spheres, and the capability to be put into the freezer before use for an ice massage if need be. This capability assists with keeping in check any inflammation you may be dealing with. To start off, we have the Moji Mini Pro. This is a small, lightweight, easy to pack, portable muscle massager, specifically made for ease of use. The flexible design allows for it to outline the shape of the muscle for overall better coverage through each motion, maximizing it’s effectiveness on the particular area. It’s a very simple design and can be used on any part of the body for soreness of muscles. The ice-feature, as mentioned above, is great for inflammation. Pack it in your gym bag, pack it in your purse. Use it at the airport, use it in the car, use it at the track or in the gym. It’s super compact and easy to carry around with you so you can have it wherever you may need it. 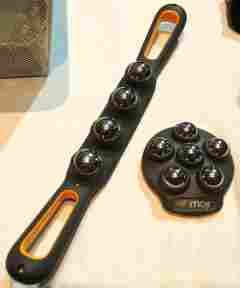 A stick massager with a capacity for free motion. In essence, this is a stick massager, but with the added value of multi-directional spheres allowing it to perform in a much more diverse manner. 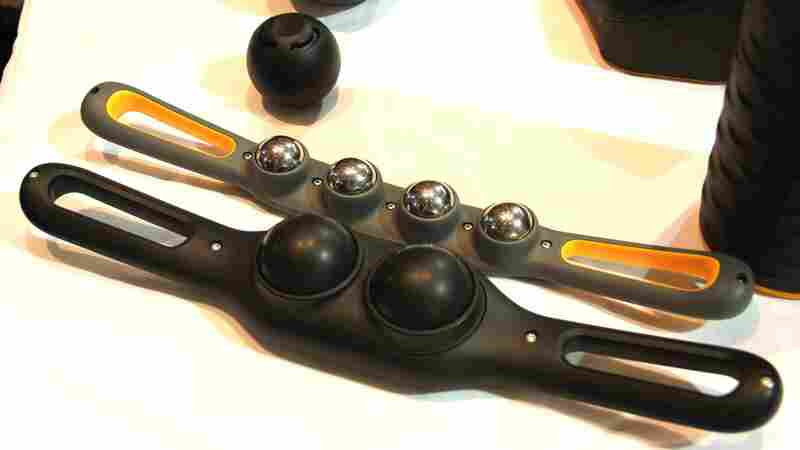 Not only does it allow you to easily motion in any direction, but also gives the ability of an ice massage, as mentioned before, due to the incorporation of these spheres seen across their PRO line. 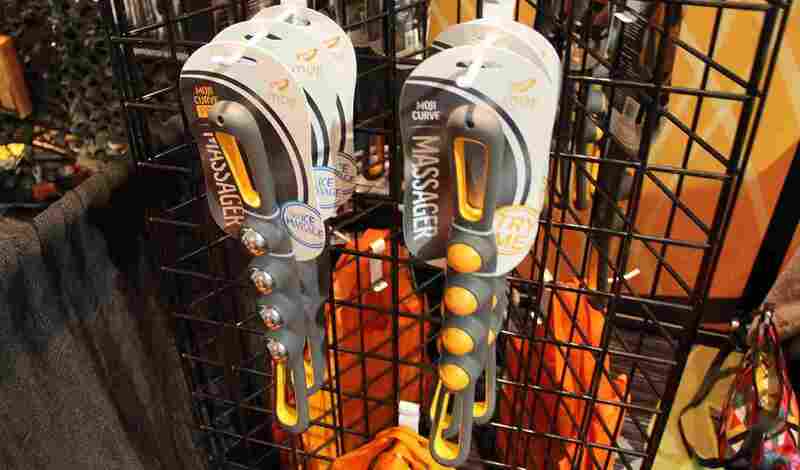 So, this is much more than your conventional stick massager. It’s diverse use allows for more effective maneuvering to reduce soreness and inflammation on quads, IT band, hamstrings, calves, and assists with common complications such as shin splints. 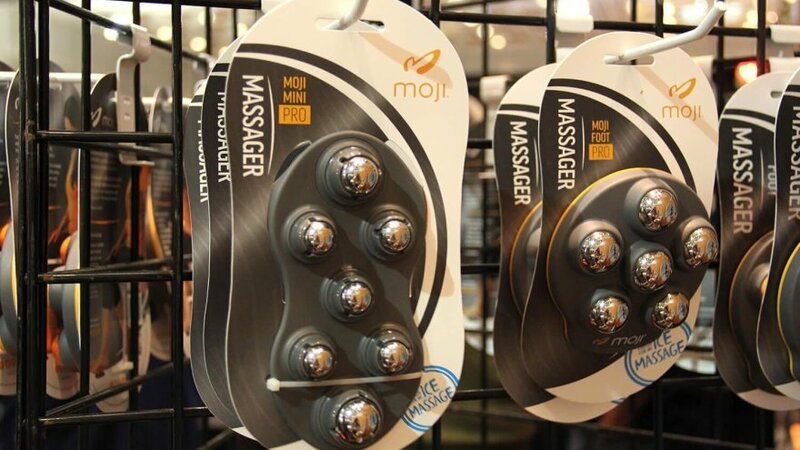 This is a foot massager, which is pretty self explanatory actually, that has a flat bottom enabling it to be placed effectively of any flat surface, including the floor, wherever you may be so you can then use as needed. It’s great for stretching the plantar fascia. You can roll your foot over it in any direction, and apply more or less pressure as needed to really get the results that your looking for with each motion. It’s super compact, so makes for easy packing to bring and use almost anywhere. As you may know already, it’s in the PRO line, so features the ability to freeze and get a nice ice massage in. That’s considering you have a freezer handy. It’s an effective design either way. You now have an overview of their PRO messagers and what to expect, but how about their heated products! These heated items are not yet released, but you can expect them to be available soon, dropping in Spring of 2017. Let’s see what we have! These come in two sizes as seen below, a four inch and a two inch. These are made to be heated and all it takes is 30 seconds in the microwave for a proper temperature. Yeah, you read that right. What’s the benefit, well you don’t need batteries and it’s super simple. The more simple, the more convenient, the better. The larger of the set are great to utilize for your hips or hamstrings and you can find further use in the 2″ for underfoot rolling. 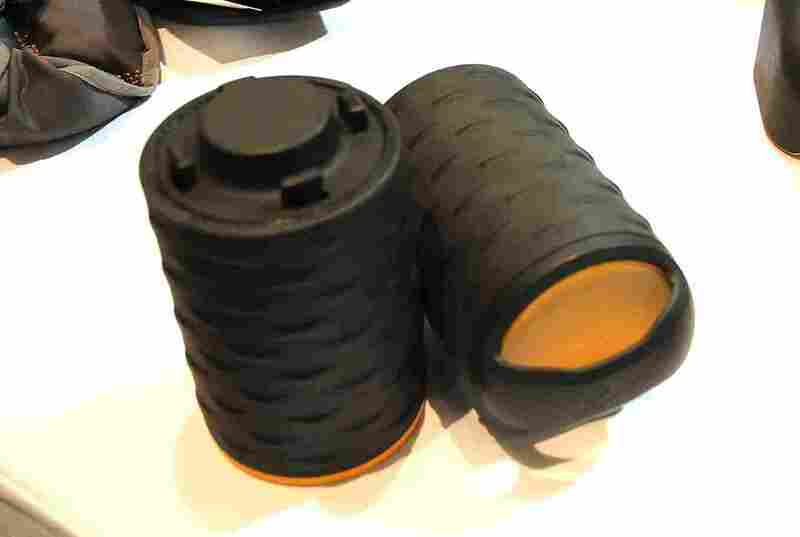 The 2″ is also great for use on the upper body because it’s small enough for proper motion using your hand. The foam roller is one of Moji’s highlight products. It’s the item behind their extremely successful Kickstarter campaign, which raised over $100,000! That’s fairly significant. The product is simple, and that’s what makes it so great. It has so many practical uses and is one of their heatable items as well. Pop this guy in the microwave for 20 seconds and you have heat therapy with a diverse spectrum of use-ability. It can be split into two pieces, so easily packs and stores, has a handle for ease of carrying, a cushioned exterior to offer a plush feel, but the firmness you need for effectiveness of a roller. It will be available for purchase soon, so keep an eye out. with a few major differences. First, it’s a heat-able product, rather than having the freeze-ability you would see in the PRO. As you can tell, the spheres are also much larger, allowing for a concentrated pressure point. It also features a removable shuttle, making the piece much easier to fit into the microwave in order to utilize it’s heat capacity, but also gives you the ability to use it as a palm-held piece, or placed onto the floor for underfoot rolling. This allows for targeting those areas not otherwise able to with the structure size of the full unit. The Duel Curve unit will be available soon! 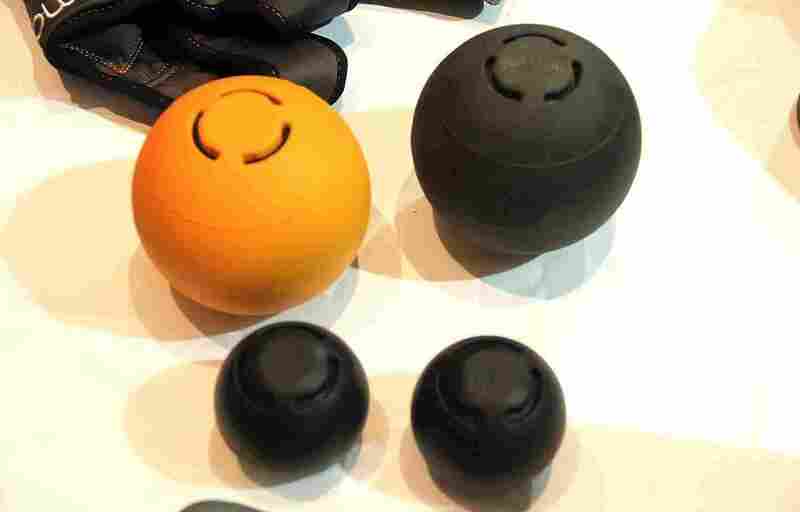 Here you can see the Duel Curve heat-able stick massager compared to the Curve PRO with a size comparison of their 2″ heat-able massage balls as well. Here’s somewhat of a change in direction to their main products. 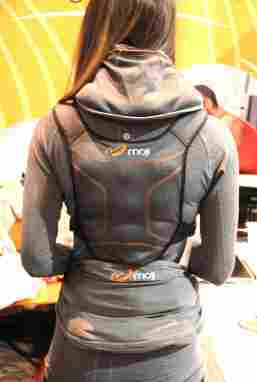 Moji will be releasing their line of wearable, heat-able recovery back wraps soon. There are three different products here. For the lower back you have a lumbar wrap, for the mid-back a thoracic wrap, and on the neck a wrap for the cervical spine to effectively concentrate heat in each particular area in order to alleviate pain, or stiffness. They are non-intrusive and anyone can easily navigate around in them, even wearing all three since they aren’t too bulky. Every one of the three units is microwaveable to get to them to the desired temperature, so no batteries or chords to connect and complicate things. They use silica gel beads to effectively hold that temperature. These products are most effective for heat penetration deep into the muscles to really loosen them up as needed. Keep an eye out as they will be releasing soon. Note: All heated products you see in this article are prototypes. There’s a reason Moji’s Kickstarter funding campaign was such a success. Athletes want products that have the potential to help them perform better, or keep them in good shape all the while providing the convenience needed to use that product effectively. So a product that can do that, while being affordable is a great thing and easy to be excited about. All of their products are extremely simple to use, and don’t require batteries, or anything extra than what’s already there, with the exception of a freezer for those that feature ice capabilities, and a microwave for those that have a warming option. I can definitely see these continuing their growth in popularity as the years progress. I hope they keep pushing the ideas they’re bringing forth. It’s good to see some innovation, especially when it comes to wellness and injury prevention.